A pacemaker is a small device with two parts, a generator and wires, that is placed in the chest or abdomen to help control abnormal heart beats. People may need a pacemaker for a variety of reasons, including normal aging of the heart and heart muscle damage resulting from a heart attack. A pacemaker can often be implanted in your chest with a minor surgery. The Automated Implantable Cardioverter Defibrillator (AICD) is a small device that is implanted inside the body to monitor the heartbeat. When the AICD senses a life-threatening change in the heart’s rhythm, it can shock the heart. The AICD is capable of correcting most life-threatening cardiac arrhythmias, while also storing information on the event. 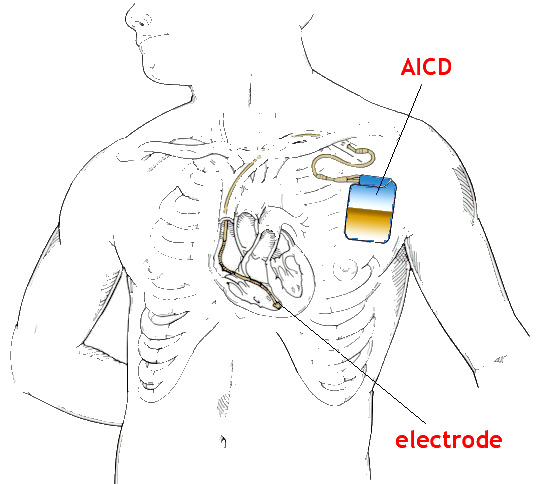 WHAT IS THE DIFFERENCE BETWEEN A PACEMAKER AND AICD INTERROGATION? Both AICD and pacemakers are medical devices that are implanted inside the bodies of heart patients, yet there are some key differences. While both continually monitor the heart beat and rhythm, the AICD will send low-energy pulses to restore heart rhythm, yet can switch to high-energy pulses when the low-energy shocks are ineffective. On the other hand, pacemakers only give low-energy electrical pulses. In general, is it recommended to interrogate an AICD every three months and interrogate a pacemaker every six months. It is important to frequently follow-up as the battery may need replacement. WHAT IS THE PURPOSE OF A PACEMAKER/AICD INTERROGATION? The purpose of the pacemaker and AICD Interrogation is to monitor and control abnormal heart beats, and make sure that blood is flowing properly throughout the body. Generally, candidates for a pacemaker or AICD have one or more of the following risk factors: heart failure, a previous episode of sudden cardiac arrest, have had a heart attack, are taking medications to treat heart failure, or have a family member who experienced cardiac arrest. The patients who are currently using a pacemaker or AICD should come to the appointment with the make and model of pacemaker/AICD because it will help Dr. Mohin when interrogating the device. Dr. Mohin is a highly reviewed and accredited cardiologist with his own state-of-the-art testing facility comprised of in-house equipment. Whether you need a pacemaker/AICD interrogation or an annual heart screening, Dr. Mohin can provide the most complete and thorough care. His dedicated staff is here to answer any questions, so that you can put your mind at ease. Need to make an appointment? Call us at (310) 659-9572, or make an appointment online, below.